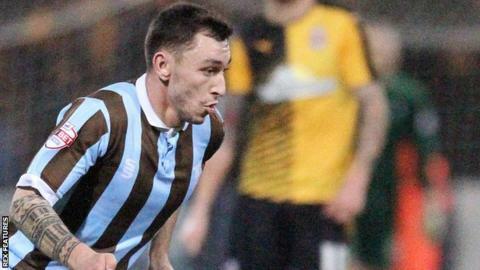 Hartlepool United have signed winger Nathan Thomas from League Two rivals Mansfield Town, with terms undisclosed. Thomas, 21, had handed in a transfer request to the management and was cleared to move to Victoria Park. He had made 21 appearances for the Stags so far this season, following a summer move from Motherwell. "I'm pleased to get Nathan because we've needed a bit of quality in the wide areas," Pools boss Ronnie Moore said. "It was disappointing that we lost Kal Naismith but now Nathan is here and he has quality. "He's a genuine left-footed player who will bring a bit of sparkle to the team and he's one of those who can excite the supporters when he picks the ball up and runs." The Ingleby Barwick-born forward returns to the north east to add to previous spells at Newcastle, Sunderland and Darlington. "He's only a 'baby' and has been around the country to try and settle and plant some roots for him and his family [during his early career]," said Stags boss Adam Murray. "An opportunity presented itself for Nathan where he has more security - a move which takes him back home. I have let him go with a heavy heart." Pools boss Ronnie Moore will have Thomas, who has also played for Plymouth, available for Saturday's visit of Wycombe Wanderers.